Can We Reignite the Passion? Originally, I said "Yay, it's back! But I'm already sad." Now I'm doubly sad, as (according to EW) due to pre-emptions in Chicago and Baltimore and Vampire Diaries going up against American Idol for the first time, the return of Smallville and Supernatural got pushed back so the CW could air VD and Nikita in rerun. This article talks about how well that worked out (or didn't). While I prepared this post last week, I ignored all the articles about "Like a Virgin," because it was supposed to have aired by now. Suffice to say it sounds AWESOME, exactly what we've been craving all season, and supposedly we'll have a new appreciation for Jared Padalecki's first-half performance. I can't wait. The new episodes were scheduled to last through February 25th, with a new hellatus for the entire month of March (now possibly altered due to this push-back). CW's schedule here. SPN-centric list of episode titles here. WFB: Is the brotherly relationship ready to go back to the path of healing, or does that road still have a lot of bumps ahead? SG: There are always bumps. It’s Supernatural. But they’re not feed-you-to-vampire sized bumps. She did another interview with Maureen Ryan that I did not read. TV Line (Michael Ausiello's new site) has a newrenewal scorecard that lists Supernatural as a sure thing for next season. Yay! 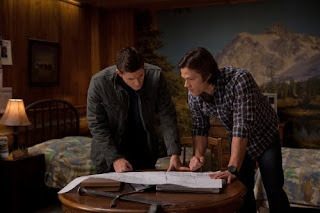 Actors are always asked if they'll return to Supernatural, and always say that on this show, anything can happen. It came up re: Mark Pellegrino last week. He's now on Being Human. Missing Jeffrey Dean Morgan? To further ensure he'll have no time for an encore appearance on Supernatural, he's soon to be starring in a new drama on Starz (unless those final negotiations fail). In casting news, Sonya Salomaa (Watchmen) will play a tough angel in a potentially recurring role. Also, Death will be returning (like we couldn't guess that) as will...ELLEN! Fringe and Supernatural are once again in competition. I for one am glad to have a dual tuner Tivo, but that doesn't make this comment by Fox exec any less irritating. The CW president doesn't seem to agree. She told E! online she'd be shocked if SPN didn't get picked up for season 7. Last week Jim Beaver tweeted that during filming of the episode, "And Then There Were None," 38 cast and crew members were sick! Yuck! Supernatural has been nominated for best sound effects in the Motion Picture Sound Editors' Golden Reel Award. And it looks like we're finally going to have a funny episode in February, titled "The French Mistake." Did you know Blog Talk Radio has interviews with production people from Supernatural? Check it out. Meanwhile, are y'all watching Being Human? I really liked the first episode, and it slides right into my Monday night TV. Last week, I read a list of TV shows that have been renewed or canceled, that are sure things or dead and buried. At the time, Supernatural was in the Danger Zone (now it's listed as Could Go Either Way). I had occasion to be depressed this weekend (I don't want to talk about it stupid Jets), and my go-to cure for such is to watch Supernatural on DVD. 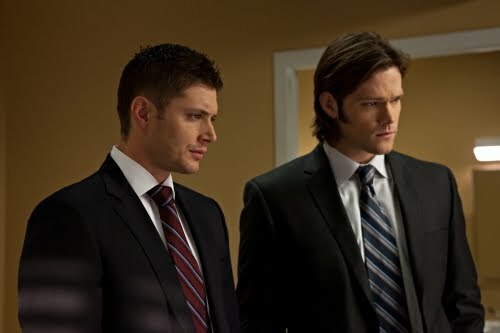 I'm watching season 4 now, and despite the rift between Sam and Dean, the natural chemistry and brotherly relationship was funny and beautiful. That naturalness is really missing this season. It's been easy for me to dismiss my lack of passion for the show. It's on Friday now, and my schedule is different. I forget the show is on, so I don't have the whole-day buildup. The people I used to chat with after the show aren't always available anymore (or I'm not), and I've always known my passion has lasted so long because of the synergy of the fandom, even when that was just half a dozen of us chatting online or posting/commenting here. So many fans, including some Supernatural Sisters, aren't happy with the show, and don't even put it as their favorite anymore. I admit, that affects my feelings. I also blamed it on maturity. No relationship can burn with the passion of a thousand fiery suns forever, right? Except that passion is still there when I pop in the DVD or recite lines from past favorite episodes. So what's going on this year? I never thought the change in showrunner would make much difference. Sera Gamble has been here from the beginning, and Kripke hasn't gone away completely. But there's a definite atonal quality sometimes. Dean is too harsh and selfish, and the heartfelt moments, the ones that lead to "let's get out of here before we grow ladyparts" comments are missing. Yes, a lot of that is because of Sam's missing soul, which means it may return next week when Sam does. I am DYING to have Sam back! But the humor hasn't been the same, either, especially between the brothers. I don't want to call it a misstep by the writers, because I've found the whole storyline intriguing. If I didn't have 5 seasons behind me as a viewer, I'd be loving the show this season. But I do have those five seasons, and no matter how much I tell myself the passion is still there, it's just matured, all I have to do is watch two minutes of an old episode to know I'm lying to myself. So what do you think? Is your passion banked, too? If so, what do you expect now that Sam's returning? Photos from the first new episode after the break, "Like a Virgin", which airs Jan. 28. And, yes, I bet you know have the Madonna song in your head like I do. Details of a potentially funny future episode. Spoiler Alert! Balthazar to return for a few more episodes. News is super, super scarce. But voting ends today in the Castle vs Supernatural battle on E! online that MJ mentioned. So try to get in a few final clicks, if you can. Buddy TV is running their Fan Favorite contest for 2010. Lucifer is up for Best Villian and Castiel is up for Best Non-Human. Sheesh! January 28th can’t get here soon enough.